I don't understand this curve thing. When you take a picture or a video, what is captured is some near and some far away images. Even if you take a picture of a flat wall, the sides are further away than the centre. So when reproduced in a photo or a screen, shouldn't these be viewed flat, as per how the camera sees it? If you looked at a large curved photo, wouldn't the picture be compressed horizontally? Wouldn't the sides look nearer than it should be? one theory about the curved thingy... could it be meant for cinema nia? since last time many audience ma, so those at the side can see better? A long but indepth technical review of the LG OLED TV 55EA9800. Worth the read. But those sitting on one side of large curved screen would see the far side well but will see the near side from a very steep angle right? I think curve screens are made for the benefit of those in the centre. To be fair to everyone, should have a convex screen - everyone will have a good view of an equal portion of the screen (but no one gets a good view of the entire screen!). But those sitting on one side of large curved screen would see the far side well but will see the near side from a very steep angle right? I think curve screens are made for the benefit of those in the centre. To be fair to everyone, should have a convex screen - everyone will have a good view of an equal portion of the screen (but no get a good view of the entire screen!). Wide screens in cinemas are curved to get rid of the image pin-cushion distortion created from using an anamorphic lens to stretch out the image horizontally. In the case of the LG 55" OLED TV, the curvature is quite slight, the edges are about 1.4" (3.6cm) forward of the centre of the screen - not a large geometrical effect. But again this is subjective. Some will like it, others will find it simply distracting. The negative part is that it is tilted slightly backwards so it is best placed on axis or lower than our line of view. It also cannot be wall mounted as the crystal stand is part of the whole TV. Just happen to see one of the LG OLED TVs on display. Got to say the contrast and colors are really fantastic. Makes my LCD stuff look ancient. Will burn-in and panel life be an issue? Read that OLEDs will lose color intensity over time, so even if the colors are accurately caliberated, how long will it last? Do we need to keep on re-caliberating? Another interesting announcement came from Kateeva, a US-based company. 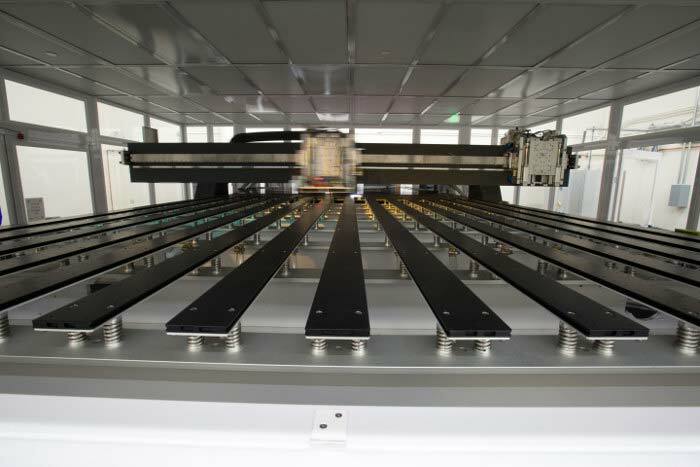 They have finished work on and announced a new OLED production machine that “prints” OLED panels. It is suitable for mass production and is said to lower production costs significantly. The CEO says that it has the potential to make OLED panels 30% cheaper than comparable LCD panels – but not from the beginning. The machine can produce OLED panels with 4K resolution in 31” sizes and up. Six 55” OLED panels can be produced in 90 to 120 seconds. The machine will be available to buy for display manufacturers around the world. It is called YIELDJet and is said to be the first of its kind. Great news for consumers... but this will kill many manufacturers' display divisions, like what happened to Pioneer and Panny, and will also affect projector manufacturers as well. To survive, I think there should only be one display technology, instead of each mfr fighting to promote their own tech. Problem is that OLED color gamut deteriorates and within couple years it may need replacing. OLED researchers knew the reliability problem of the Blue OLED and that's one reason that has taken TV manufacturers so long to bring OLED TV to the market. LG is one company that has successfully side-stepped this problem and use panels with only white OLEDs that are overlaid with RGB colour filters for their OLED TV.